An unexpected element in a day of comment from very different industries: like publishing, they don’t hear from each other often, either. We’d all do well to listen up. Among those who participate in the busy publishing conference seasons each year, some of the most energizing opportunities are those in which publishing’s brightest players glean the digital savvy of other businesses and media. The connection isn’t fulfilled: the audience feels it’s listening in on a Silicon Valley executive break room discussion, the publishing world seemingly forgotten in the process. 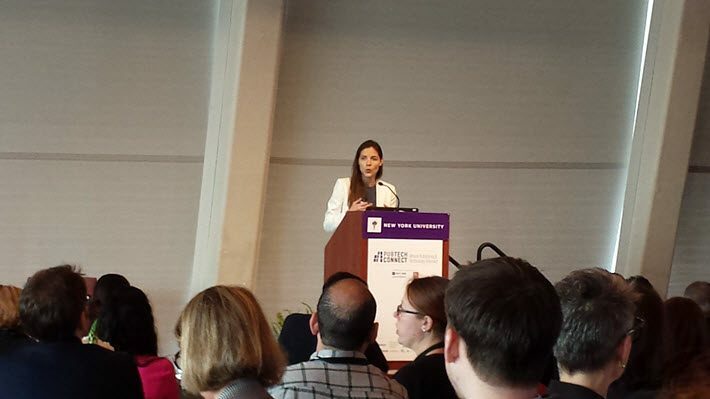 On Thursday, Publishers Weekly and New York University’s School of Professional Studies Center for Publishing were successful in stepping around both classic stumbling blocks, in co-producing a new conference, PubTechConnect. For one thing, the concept held: the day ended with a panel on “electrifying” legacy brands featuring speakers from National Geographic, Cadillac, and General Electric, as well as Quartz from The Atlantic. And the connection was made with publishing, and in a curious way. At some point late in the morning, it became evident that these folks from organizations as disparate as Dropbox and the City of New York don’t frequently hear from each other anymore than publishing hears from them. All day long, there were interesting listening patterns going on, raised eyebrows across the stock market, quick notes being made of something heard from the other end of a panel. Engage in business model innovation. 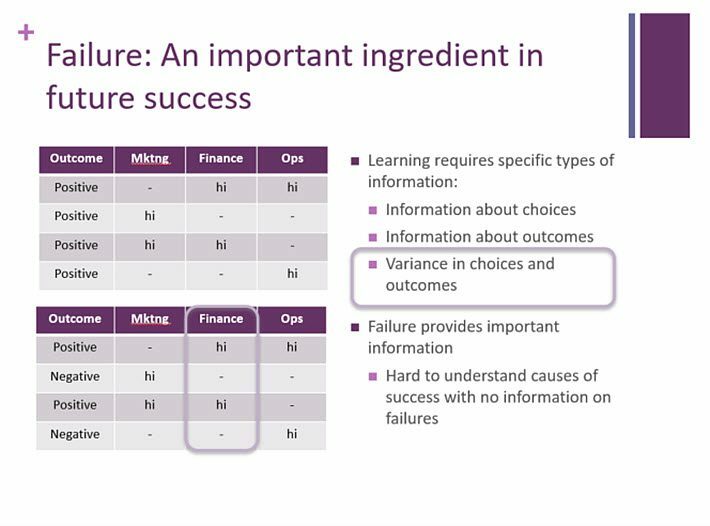 In this and many ways, a company’s willingness to attempt what Eggers calls “radical projects” over incremental ones is damaged, progress is impeded, fear of failure wins because the evaluation process is short-circuited. Eggers’ commentary was a full-on 30-minute lecture, but a good one, and the day’s tone was less pedantic than exploratory. 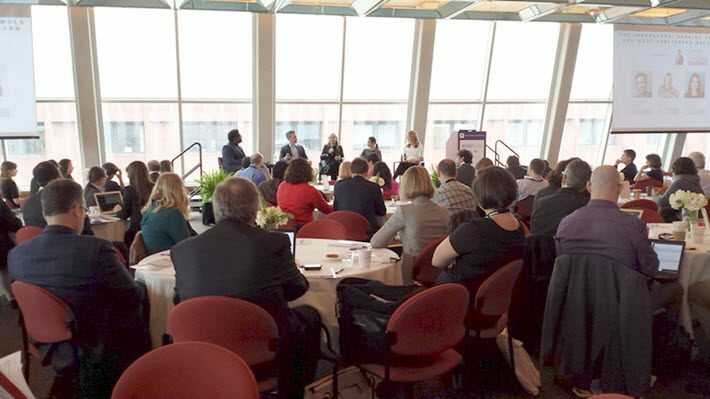 Granted, such session titles as “Shaking Up the Mold and What Publishers Need To Learn” might seem to talk down to the publishing-industry attendees who gathered in the Kimmel Center’s beautiful glassed Rosenthal Pavilion at NYU. But this wasn’t the case. For the most part, speakers were well aware that their audience was looking for observations translatable to the needs of a publishing industry that has probably has made more progress in the digital transition than it’s credited with doing. If anything, what the industry is struggling with now is the sheer expanse of the digital entertainment landscape and a book-loving consumer base that may be more reticent than the business to moving forward. Twice during the day, recruiting and management consultants spoke about a workplace grappling with generational divides. Lindsey Pollak, for example, spoke of how millennial workers have never known anything other than the kind of workplace upheaval that older employees find so disorienting. And she stressed that younger workers are hungry for feedback, needing far more input than the classic annual job review can offer. Seventy-seven percent of millennial employees say they’d like for work to be a support system. 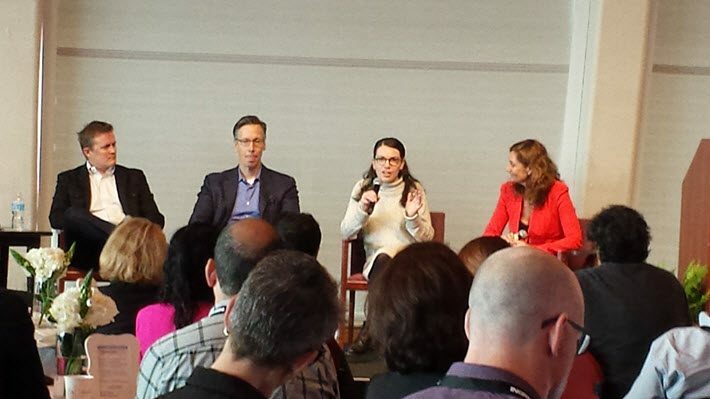 It was particularly useful to find Goodreads’ Otis Chandler and HarperCollins’ Chantal Restivo-Alessi onstage with MailChimp (Tom Klein), Vice Media (Ciel Hunter), and Conde Nast (Howard Mittman). What emerged was a surprisingly coherent conversation. The kind of “full 360” approach that Kaiken Entertainment’s Laura Nevanlinna talks about—exploiting all channels of commerce for content—was echoed in Hunter’s talk of the upcoming “Refugee Week” content that will be produced entirely by Vice’s European forces, to be played out on every medium, from Instagram to Icelandic television. Chandler talked, in turn, about a similar deep dive into Goodreads’ Amazon-owned platform capacity to leverage backlist in support of new titles. By having author Charles Duhigg Kindle-annotate his 2012 The Power of Habit, Goodreads was able to boost Duhigg’s 2016 Smarter Faster Better (both Random House) on the strength of Goodreads’ 60-milllion-user platform, the biggest reading community in the world. And Restivo-Alessi talked of HarperCollins’ focus on “communicating where users spend their time,” something that Hillary Kerr echoed as looking for what your users are doing and build subscription around that. Working with younger employees’ needs and expectations, and sharing information with them as transparently as possible. The event was co-chaired by NYU’s Andrea Chambers and Publishers Weekly’s Carl Pritzkat, the two of them opening the day together. And one of the strongest format elements of Chambers’ programming show-starting keynote four-hander, in which New York City’s digital czar Sree Sreenivasan and The New York Times‘ innovation chief Kinsey Wilson basically interviewed each other. “To some extent,” Kinsey said, “even our mobile app had become a legacy product” a couple of years ago. And finally, Jim Bankoff of the Vox Media group of eight brands had some of the most penetrating comments late in the day—ironically among the most applicable to book publishing, while his media outlets are some of the farthest outfits from the industry. He made the point that, “We believe in building brands through talent and technology, in solving problems around media consumption at scale with quality. “An eye toward optimizing where the audience is. Today that may be Facebook and Snapchat” but not always. Those topics could well be genres for publishers. And those platforms—whichever are next—will be where publishing’s consumers are.